Or salsa. One of my favorite restaurants, Cafe Red Onion, serves a pineapple salsa with their chips. It’s sweet. The chips are salty. And it’s exactly as good as you’d expect. I OOooh’ed at the site of the recipe for pork chops with pineapple and rice in Everyday Food last month. The salsa alone was really good, perfect to dress-up a plain ol’ grilled chicken breast. By the time I was ready to put dinner on the table, the salsa had cooled – perfect. I debated mixing the salsa with couscous instead of putting it on the chicken but the Foodie Groom voted “chicken.” On to the chicken it went! 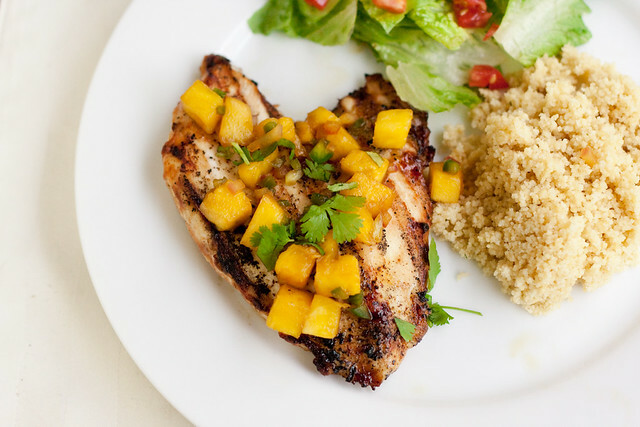 Grilled chicken and juicy fresh pineapple make for a delicious 20 minute dinner. Heat grill to medium-high. Pound chicken breasts to an even thickness. Spray or lightly brush chicken breasts with olive oil and sprinkle salt and pepper. Grill 3-4 minutes, each side. In a small pot, bring chicken broth to boil. Stir in couscous and cilantro. Turn off heat and cover. Let sit 5 minutes and fluff with a fork before serving. Heat olive oil over medium-high. Add pineapple, jalapeno, and red onion. Cook for 2 minutes, until the vegetables have softened. Turn off the heat, stir in the soy sauce. Divide the couscous between 4 plates and serve the chicken topped with the pineapple salsa. I feel the same way, and I also get very excited about mangoes! I made this too! It’s great! I love those type of meals in Everyday Food. I’ve loved trying fruity salsas with meat lately, and this is next on my list! Thanks for the great summer recipe! Red Onion was one of my favorite restaurants when I lived in Houston, precisely for their pineapple salsa! I haven’t found a pineapple salsa like it since then. Pineapple is a love of mine as well, except for the fact that it gives me a stomachache. I think I’ve developed a slight allergy to it since eating it compulsively all through college. I am a sucker for savory dishes with pineapple…I love juicy grilled slices of pineapple. Your recipe looks great. Oh, YUM! That both sounds and looks delicious! A must make! 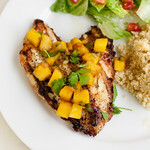 Congrats on making the top 9….I love your salsa…fruit goes so well with grilled chicken and fish! Looks YUM! Reminds me of a recipe I just made from the recent WW mag. Crab cakes with mango relish. Soo good! Then they show up in the Instructions like magic. Where did they come from? Fixed it – thanks for letting me know!